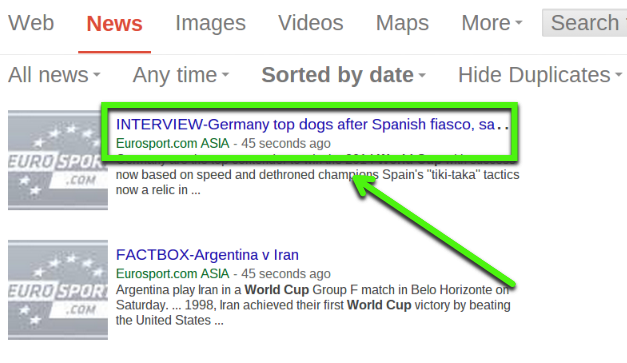 In addition to a general web search, there may be times you want to search Google News. 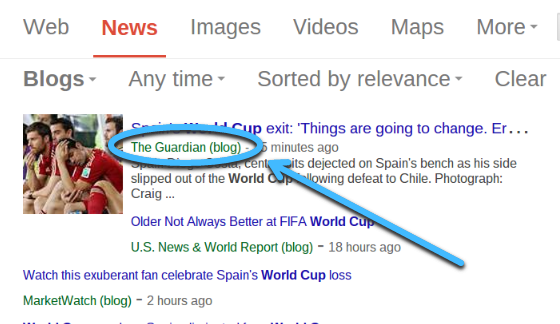 Selecting News from our World Cup Google search will give us a default view of general results. We will need to use Search Tools to filter our results. In the All News tab we can filter our results by Blog or All News. If we want all news results - Google News - then All News would be our better choice, but if we are curious of what the blogosphere has to say on the topic, Blogs would be the better opton. This type of search would be ideal for a Current Events project. Another option for filtering is Sort by Date which allows you to get results by relevancy or date. If you sort by date the results are given in chronological order. This could be useful if you earlier filtered by blog because this is typically how blogs are published. However, even with All News there may be times you are following a particular news event and you want the most current news items. As you can see after each result you are given a time stamp on how recent the result is.